It’s that thrilling, yet horrifying, time of the year again, Halloween. During this time of the year, people tend to get into the mood for Halloween by watching scary movies, playing pranks on each other, and searching for places that will bring great fear upon them. Many people enjoy going on haunted hayrides, haunted trails, and seeking out just about any place that will give them a thrill. If you do your research carefully, you can find some creepy places around Illinois. The Lincoln Theatre is located in Decatur, Illinois and is said to be one of the scariest places in the country. There are lots of paranormal activities that are said to go on there. Some people have seen figures in the seats as if someone is sitting there watching a play that isn’t going on. People have also reported seeing apparitions on the stairs behind the stage and hearing footsteps coming up the stairs. Check out this creepy video about the strange happenings at Lincoln Theatre. Bachelor’s Grove Cemetery is located in Midlothian, Illinois within a forest reserve. Near the cemetery is the Midlothian turnpike, where Al Capone shot people and discarded their bodies into the pond within the forest. People have vandalized the cemetery by turning over gravestones, as well as digging up the bones and skulls of the deceased. There is an interesting story of a phantom farmer and a lady in a white gown whose pictures have appeared in articles and websites across the world. Watch this video to find out their stories. Resurrection Cemetery and Archer’s Avenue are both located in Justice, Illinois. Archer Avenue is an eerie road to travel down these days. The story goes that a girl named Mary Bregovy attended a dance at the O’Henry ballroom (now Willowbrook ballroom) with her boyfriend. Mary and her boyfriend had an argument and she ended up walking home. As Mary walked down Archer’s Avenue, she was struck by a car and was killed. Her parents buried her in Resurrection Cemetery, but eventually her grave was moved, and that’s when things got interesting. Here is more of Mary’s story below. 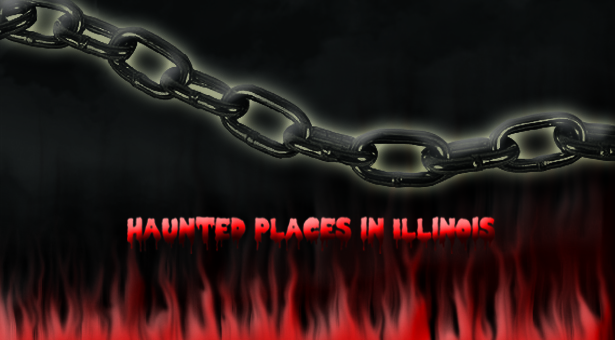 There’s lots of haunted places in Illinois, but what about outside of the midwest? Matthew Santoro has this covered with his fascinating, yet frightening, video entitled “The Top Ten Most Haunted Places on Earth.” Matthew Santoro makes a lot of great videos, including a video called “Ten Terrifying Serial Killers Who Are Free Right Now.” Be sure to check out some of his videos, and have a safe and spooky Halloween.